This internship will work with the Volunteer Engagement Team in the People and Culture Department to support the Center’s 1,200 volunteers. The Volunteer Engagement Intern will gain valuable experience in non-profit and volunteer management and will be the primary organizer of the Fish Kitchen Support Volunteer Program; a program that involves coordinating over 500 one day or short-term volunteers during the spring season. The intern will also assist with planning and coordinating the annual Volunteer Appreciation Week, a recognition week to honor our incredible volunteer community. He/she will also assist with other tasks as needed. The person in this role will have an amazing opportunity to grow in their professional development and gain valuable organizational, administrative, and inter-personal skills. Other benefits include the opportunity to work in a comfortable, friendly environment that includes over 70 staff and 1,200 volunteers who are all deeply passionate about ocean conversation. This is an unpaid, part-time internship position and college credit may be available. 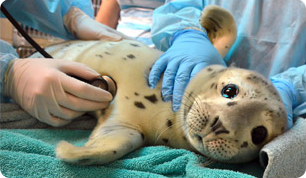 This role reports to one of two Volunteer Coordinators and is located at The Marine Mammal Center’s main hospital in the Marine Headlands in Sausalito, CA. Ideal candidates serve 2 days a week for approximately 16 hours for 4 months from February 19, 2018 through June 15, 2018. We offer flexible start and end dates. Time off must be arranged in advance. Deadline to apply is Sunday, November 26, 2017.